Is it too early to be thinking about Christmas baking and cooking? 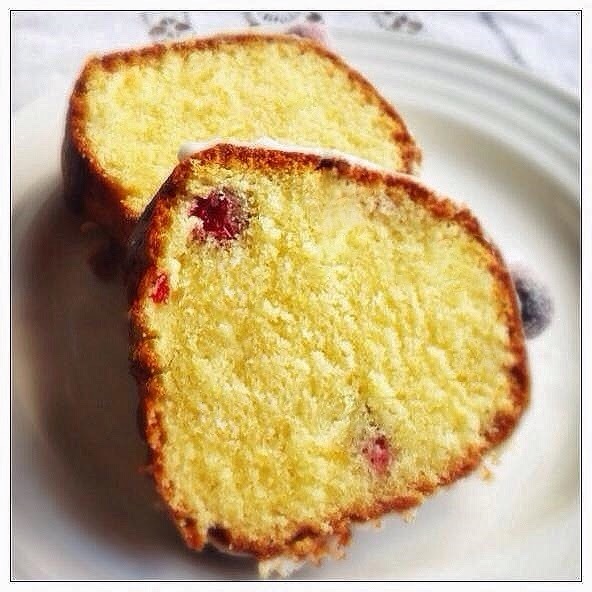 Well, the thing about this cake is that although it borrows from the flavours of Christmas, it is a great cake in its own right and is something delicious to make when fresh cranberries are in season; it doesn’t have to be confined to Christmas alone. Cranberries can be somewhat sharp, so do need a little sweetening… but if you use too much sugar you risk drowning out their distinctive taste. 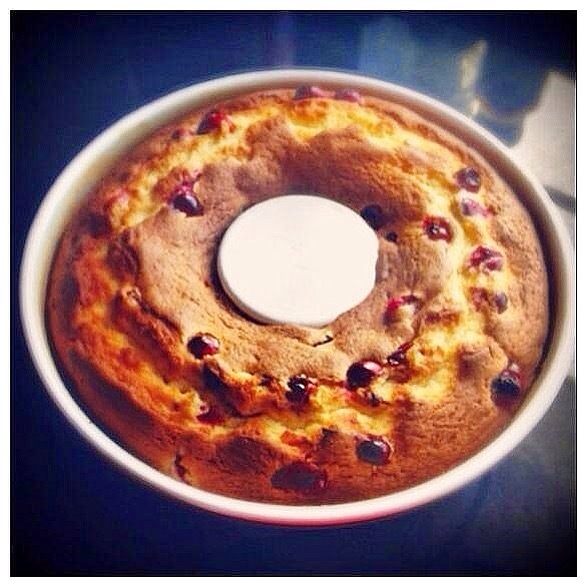 I have paired cranberries with orange in this cake and really feel that the orange lends a natural fruity sweetness that balances out any sharpness perfectly. The cake has a close crumb and is unusual in that cream cheese is used along with butter to add richness to the cake. Despite this, the cake is not heavy and although close textured has a lovely velvety feel in the mouth when eaten. The cream cheese adds a very subtle tangy note but this is barely discernible and in my opinion adds a depth of flavour and a certain complexity to the finished cake. The other great thing about using the cream cheese is that it adds substance to the cake batter, which prevents the cranberries from sinking as the cake cooks. 1. Preheat oven to 180C/Fan Oven 160C/Gas Mark. Using some butter, grease a 28cm ring/savarin tin and then dust with a little flour, shaking out any excess. 2. Place the butter, cream cheese in a large bowl and using a hand held electric mixer, beat together until light and fluffy. Add the grated orange zest and mix through. Gradually add the eggs beating well after each addition until they too are fully incorporated. 3. Sift the plain and self-raising flours together and fold into the cream cheese mixture making sure that there are no pockets of flour remaining. Finally add the cranberries and mix through so that they are well distributed. 4. Spoon the batter evenly into the prepared tin and level the surface with a spatula or back of a metal spoon. Bake in the preheated oven for 35-45 minutes until well risen and firm to the touch or when a thin metal skewer inserted into the cake comes out clean. 5. Allow to cool in the tin for 10 minutes before turning out onto a wire rack to finish cooling completely. 6. Using a pastry brush, light coat the surface of each cranberry with a little egg white before tossing in some caster sugar. Set aside on a clean plate and allow the sugary surface of the cranberries dry out a little. 7. 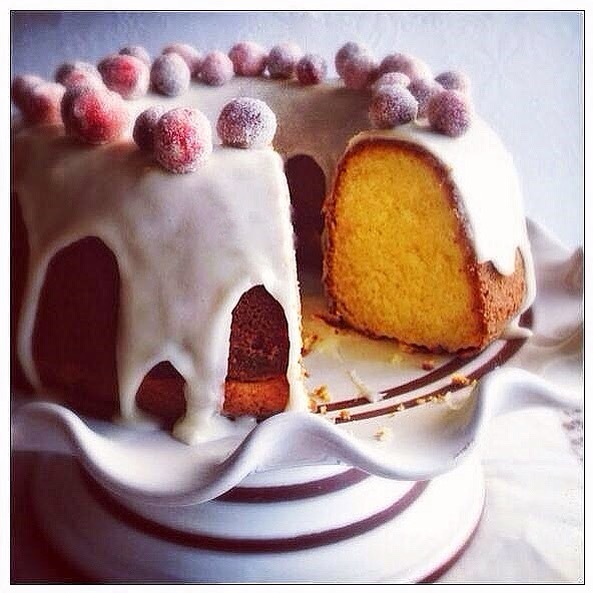 Mix the icing sugar and enough freshly squeezed orange juice together to create an icing with a ‘coating’ consistency. Spoon over the top of the cake and allow to flow naturally down the sides of the cake. 8. 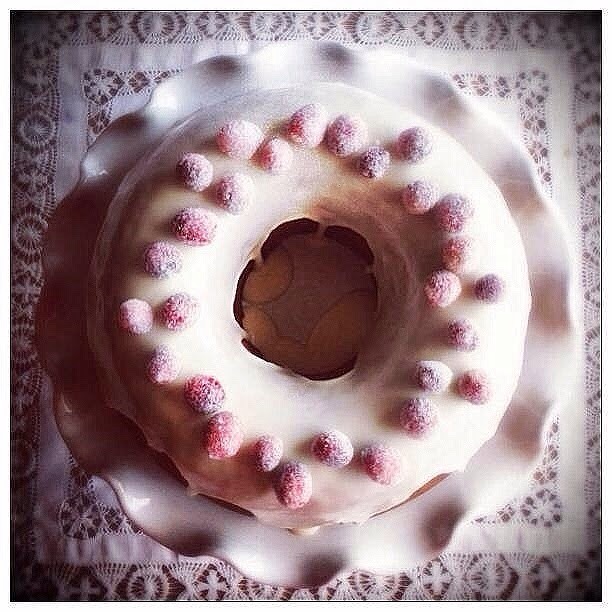 Decorate the top of the cake with the frosted cranberries, by placing them on the glacé icing before it hardens.